The primary work of this society is to provide seminarians who are preparing for priesthood with financial assistance, especially those who are not in a position to support themselves. Members also commit themselves to pray for vocations to the priesthood and religious life and for those preparing for priesthood. The parish branch of the society meets once a month. There is a very active branch of the Society in the parish. They are generously supported by parishioners through the monthly church gate collection. 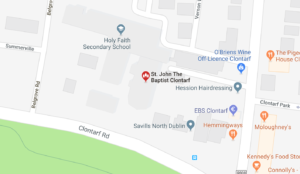 The society use their funds to support people in need both within the parish of Clontarf and in adjoining areas of the city where the needs can be greater. This is a group of parishioners who stand ready to accompany any adult who wishes to make the journey towards baptism. They meet with the candidate or candidates once a week, sharing their own faith in the Lord and their understanding of that faith. They form a supportive community for those who are seeking to know the Lord and who desire to be received into his body the church.